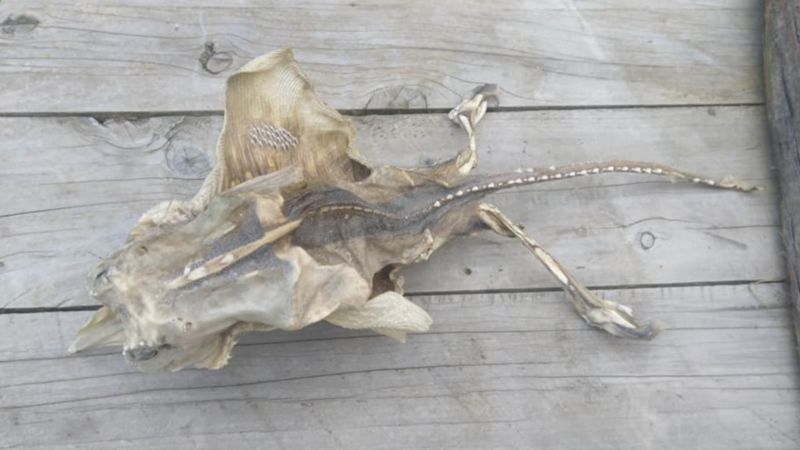 Christchurch resident Hanna Mary was doing her civic duty cleaning the debris from a local beach after a violent storm when she fell on the remains of a truly strange creature. Last Saturday, Mary and her mother were cleaning the beach near the Rakaia huts in Canterbury when they stumbled on the grotesque skeleton. Of course, Mary shouted in fear that it was not just a piece of driftwood or a plastic bag. "My first thought was that it was something from abroad, but I was more fascinated than anything else," he said. Mary told the New Zealand Herald. Be that as it may, the creature had claws on its wings, two claws, a long tail, an elongated head, and ferocious fangs. Nightmare by most people. The discovery was made even more unusual as the beach is very rocky with a steep drop off the shore, making it almost impossible to swim there. Mary was hesitant at first to move the skeleton, fearing that it might be a poison, but curiosity won her out and she brought it to her taxidermist neighbor, who was also puzzled by what the mad creature would have could be. "I uploaded the photos to Facebook and we all had guesses, most people said skateboard", Mary continued. "I suppose it's a kind of deep-sea ray, maybe a Bathyraja abyssicola, that would have been picked up by a trawler." Facebook users have come up with suggestions such as: "A penguin … Lol, I do not know, it looks bloody," "Alien really stranger, finish with the aluminum paper hats" and "flying squirrel fish". Dr. Malcolm Francis ended all wild speculation, confirming that the creature was a male, Dipturus nasutus AKA, a rough skate from New Zealand. "It's like a flat shark, it has a cartilage skeleton. They spend a lot of their time at the bottom, Francis said, adding that the claws of the wings, known as wing spines, and the clasps are only found on male pads and are used for mating.